Take Route 287 to Route 23 to Green Pond Road in Newfoundland. Make a left turn onto Upper Hibernia Road. Make a left onto Split Rock Road. Follow Split Rock Road across the Splitrock Reservoir Dam. The parking area is on the left. This forested wilderness connects watershed lands and is crossed by an old logging road. Streams, mixed oak-hardwood forest and swamps comprise the park. Trail entry is through the Farny Natural Area. Split Rock Reservoir is adjacent to the park. 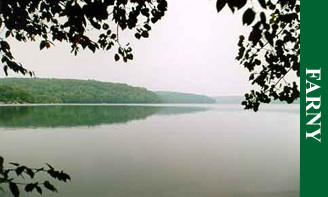 The natural area lies adjacent to Splitrock Reservoir and supports a mature mixed oak hardwood forest characteristic of the Highlands physiographic province. Tall red, white and black oaks dominate the forest canopy, which also serves as habitat for the endangered red-shouldered hawk and threatened barred owl. Numerous trails cross the natural area. Parts of Farny State Park are open for hunting. For information about hunting, refer to the New Jersey Fish and Wildlife Digest or contact the park office.